Arsenal midfielder Mesut Ozil is yet to recover from the disappointment of his penalty miss against Bayern Munich, according to manager Arsene Wenger. Ozil, 25, the club's record signing, saw his spot-kick saved in the midweek Champions League loss and apologised for the defeat to fans on Facebook. Wenger said: "Is he alright now? Certainly not because 48 hours is a bit short to get over that." Arsenal, second in the Premier League, host Sunderland on Saturday. Mesut Ozil is the only player in this season's Champions League to miss two penalties. His other spurned opportunity came against Marseille in the group stages. Former Arsenal great Dennis Bergkamp will be honoured when a statue of him is unveiled ahead of the game. Wenger says Ozil can take take comfort from the fact the Dutchman, who missed a last-minute penalty in an FA Cup defeat to Manchester United, went on to become a fans' favourite. "We had examples before like Bergkamp in '99 and he refused to take any penalty after it. He gets a statue today," said Wenger. "A penalty is part of how you feel and how much you want it. At the moment we have to let Ozil recover, it is part of the job to get over disappointment and show how you respond." Wenger says the playmaker is unlikely to take a penalty if Mikel Arteta, who returns from suspension against Sunderland, is on the pitch. Ozil signed from Real Madrid for £42.5m in September 2013, but has drawn criticism for recent performances and is without a goal in 14 matches. Arsenal shareholder Alisher Usmanov said the German "was not playing at his capacity" and cited tiredness as a possible factor after the defeat by Bayern. Ozil was brought down to win the penalty he then missed against Bayern. This season, in Europe's top five domestic leagues and the Champions League combined, 63% of penalties taken by the same player fouled to win the spot-kick have been converted. In contrast, 81% of penalties have been scored if the taker was not the man fouled. "I think Ozil is a classy player and on a longer period, class tells always," said Wenger. "I wish that one day Ozil will get a statue outside the stadium as well and I will still be good enough to come and watch him." His penalty miss - while the match against the German champions was goalless - proved decisive, as goals from Toni Kroos and Thomas Muller gave Pep Guardiola's side a 2-0 advantage ahead of the second-leg on 11 March. "The next morning doesn't feel better either," Ozil wrote on Facebook. "Sorry guys - it wasn't planned that way." Goalkeeper Wojciech Szczesny was sent off for conceding a penalty - which was also missed - earlier in the match. 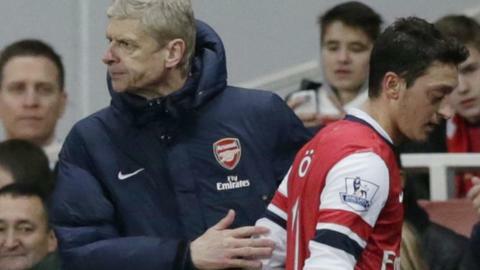 Wenger confirmed the club would discipline the 23-year-old after he made an offensive hand gesture when leaving the pitch.